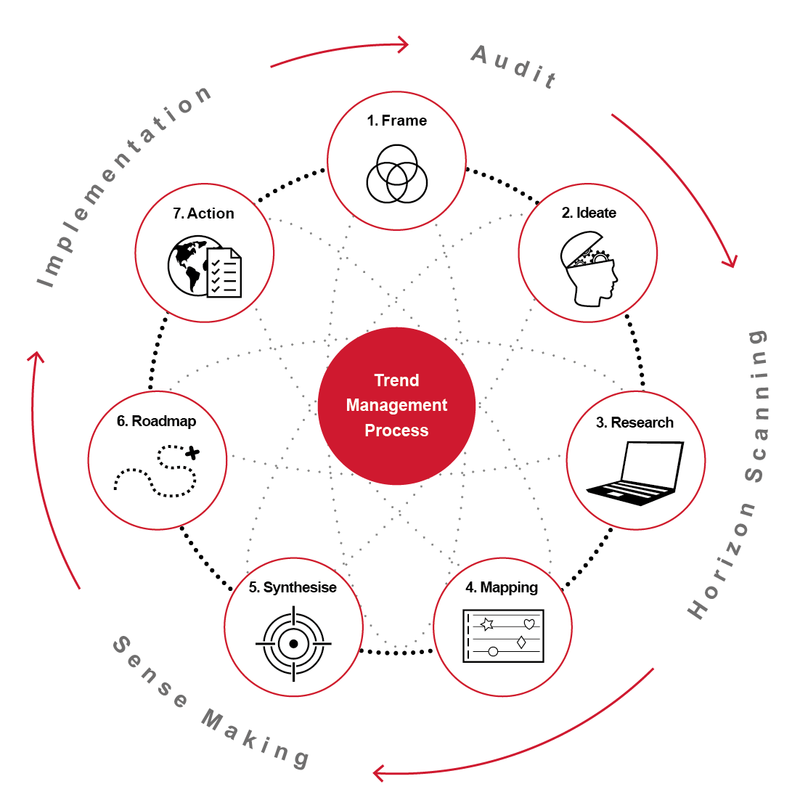 Kjaer Global are pioneers and experts in trend management. We help businesses develop future-focused ideas and strategies that foster new thinking. Using our unique methodology and trend toolkit, we highlight risks and opportunities to better understand the future business climate. Our innovative, design-thinking process includes industry segment analysis, trend mapping, future scenarios, consumer segmentation and strategy roadmaps. We can all learn to take advantage of change – trend management provides us with the right tools for navigating the future. At Kjaer Global, we train people and organisations in processes required for confident business transformation, strategy planning and innovation. We support our clients in change management, communication, branding and innovation, offering an evidence-based, outside-in perspective to drive new initiatives forward. 1. Frame: The first step is to frame your business challenges and establish the central objectives for collaboration. This process typically involves key stakeholders and project owners. Exploring your current knowledge ensures we share the same background, expectations and starting points. 2. Ideate: Interviews, brainstorm and workshops help us to expand on the brief and objectives. We challenge the status quo and open up to fresh perspectives and strategies for optimising the outcome of the collaboration. 3. Research: To contextualise the current situation, we apply a wide lens to explore demographic changes, geopolitics, economic developments and legislation. We consider potentially disruptive forces – from technology breakthroughs to new lifestyles, consumer behaviours and business models. 4. Mapping: In the information-gathering phase we use our multidimensional platform, filtering and analysing research to provide a holistic and balanced perspective. In workshops we deep dive on specific issues and areas to fully capture, understand and map the trends influencing your business. 5. Synthesise: Our sense-making tools and analysis consolidate and validate findings. The outcome is a synthesis of the most valuable insights and ideas – a practical roadmap of tools, including narratives and scenarios built around people and situations. 6. Roadmap: We envisage plausible futures using our roadmap tools. These are framed around specific ‘what if’ questions that emerged from the horizon scanning. This process moves current thinking forward, inspires new vision and business concepts to inform your strategic roadmap. 7. Action: Findings are balanced within our 4P framework of People, Planet, Purpose and Profit. Working in close collaboration with core stakeholders and strategy teams, we develop a robust framework to achieve tangible results that match your original project objectives.